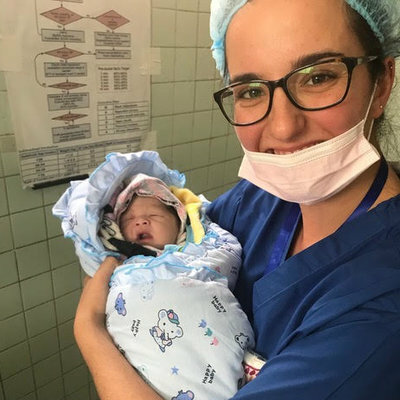 Throughout my training to become a midwife I have always been fascinated by maternity practises in areas across the world. Even the two hospitals under the same trust where I work are vastly different in their approaches. The thought of tying myself down to one elective placement was bizarre as I wanted to go everywhere. I wanted to work with specialist drugs misuse midwives in Nottingham; acupuncture midwives; doulas; see the fantastic home birth rates in the Netherlands and then experience how developing countries approach maternity. 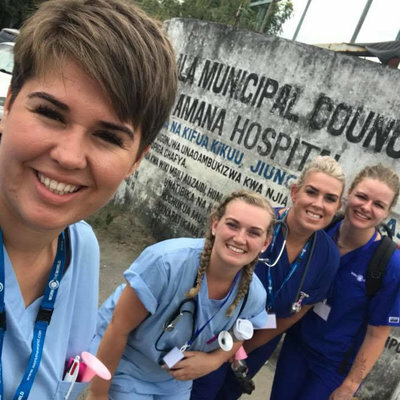 My final decision was made when I read a case study by Lois Currums, a Midwifery student, who had gone to Ghana with Work the World. She sounded like she had had a truly great time and been well supported through it all. My experience in Ghana was exactly what I wanted out of my elective placement. I learned from the Ghanaian midwives and doctors and they also listened to me when I talked about the use of birthing balls; water and combitracts. My faith in a woman’s power to resist interventions such as an epidural was increased by witnessing the strength I saw in my short stay. As an elective student at the hospital you can make the experience your own. Hours are flexible and you can choose whether you do night or day shifts. You can also choose whether you want to spend your day at the HIV clinic; neonatal unit; antenatal clinic; antenatal and postnatal wards or the labour suite. During my placement I spent a lot of time getting to know the team of midwives on labour suite. At this point I would really like to pay tribute to them and a woman who lost her life during my placement. For the purpose of confidentiality I will call her Jessica. 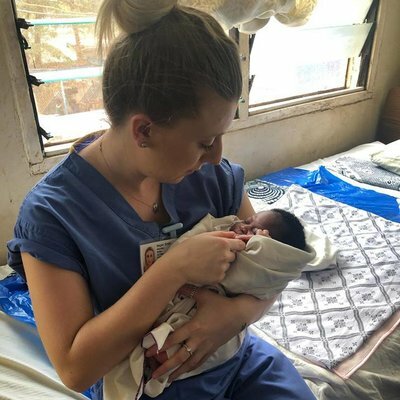 Jessica suffered from a uterine rupture during her labour and although the care was exemplary by the doctors and midwives there was not enough blood to replace what she had lost. The care was pretty much what it would have been in England from when she started having a postpartum haemorrhage to when the decision was made to perform a hysterectomy. It was a very sad night and meeting her family afterwards was heartbreaking. Her baby was healthy and beautiful and her partner said he would be able to feed it when he took it home. On returning to the Work the World house me and a student midwife from Ghana talked about our experience with one of the staff. A silver lining I have taken from this is that they were inspired to donate blood when they heard about Jessica’s story. The strength of Ghanaian women is inspirational. Not only do they click their way through contractions but when they have reached the second stage of labour they manage to walk between two rooms in order to bring their newborn to this world. My faith in a woman’s power to resist interventions such as an epidural was increased by witnessing the strength I saw in my short stay. The culture in Ghana is so different to the UK. The Work the World house offers a Fante lesson weekly which is the language that will get you by when you are talking to the locals. John, the teacher, loves to talk about the culture and give you tips like not shaking with your left hand as it is seen as dirty. Another interesting fact I learned from the Midwives at Jemima was that women would wear white clothes for three months during the postnatal period as a mark of triumph. I also spent an afternoon with Dr Ronald Sowa, the HIV and Aids co-ordinator for the hospital. His work was truly inspirational and he was really keen to talk about the work he was doing in the hospital in regards to treatment and the difficulties they had overcome in funding the antiretroviral treatments for his patients. This was one of the highlights of my stay as the patients were so friendly. Ronald is also quite the celebrity in Ghana as when I visited he had recently been headline news in the national papers for releasing the statistics surrounding the prevalence of homosexuality in Ghana. What I thought particularly fantastic about the Work the World house was you were mixed in with other students from different professions and different countries. I got to learn about the state of Midwifery in the United States and how medicalised it was there. On when returning from a shift there was always someone to debrief with as sometimes the culture differences were quite overwhelming. The weekends were also a great time to travel. I was unfortunately only in Ghana for two weeks but still managed to go to the famous canopy walks in the trees and spend a weekend on the beach. The canopy walk through the jungle is beautiful and I do recommend it. The team at Work the World will recommend places to visit and give you clear guidance on getting a TroTro which is an experience in itself! I would like to finish off with a massive thank you to not only the team in the house in Ghana but the team beforehand that ensured I packed everything; got vaccine up and applied for my visa in time. I really grew as a person from my experience and truly appreciated the National Health Service. Once you have seen a waiting room in an antenatal clinic in Ghana you never complain again about your local GP! My many thanks also go to the healthcare professionals in the hospital that taught me skills in looking for anaemia without blood tests and many other life lessons.